The time has come to experience the reinvigorated glass block shower. No longer are you limited to stacking one 8” x 8” clear unit on top of another! Check out these 5 evolutionary ideas – then don’t be afraid to put your own creative stamp on this timeless product. 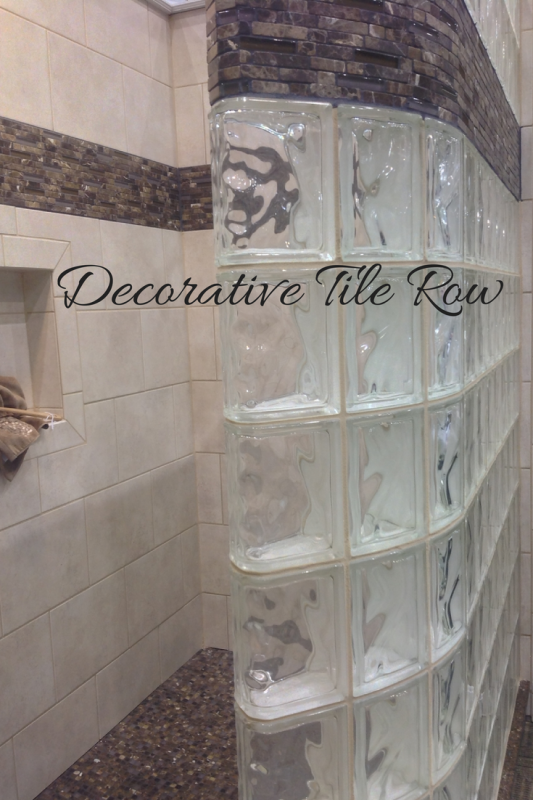 Innovation #1 – Decorative tile border – Why not carry your decorative shower surround ceramic or glass tile border right through the glass enclosure? 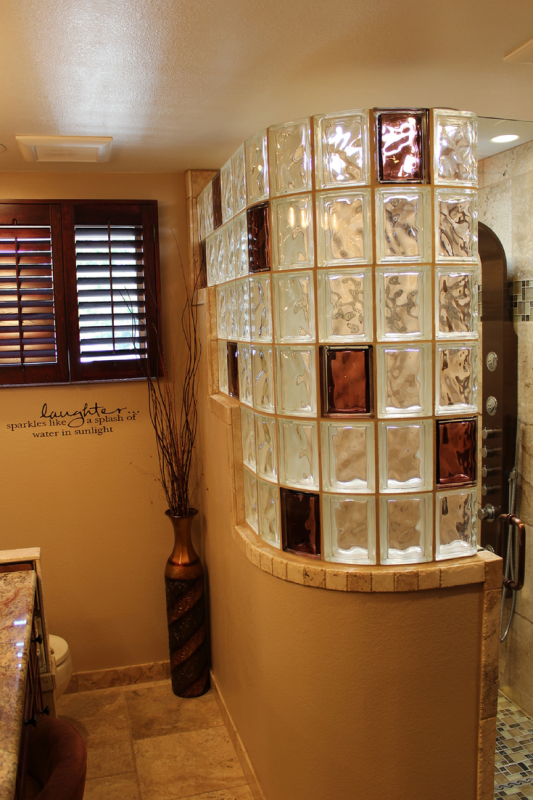 What a fun and decorative way to get extra light into the shower while creating a contemporary look. Using a clear glass wall can also provide extra light and safety into the space for an elderly parent or someone with vision challenges. 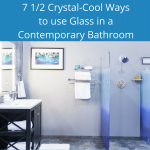 Innovation #2 – Add color – While clear glass in nice – color is nicer. 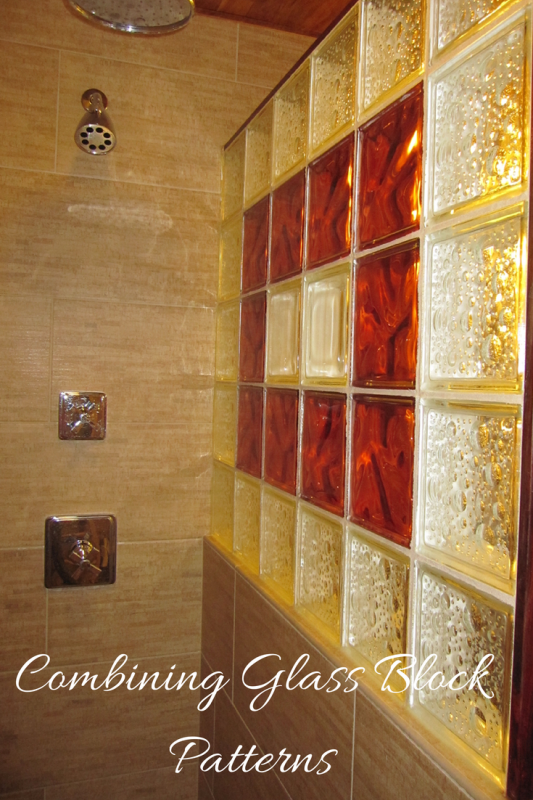 With over 104 colors and sandblasted finishes there is bound to be a color (or two or three) you could use to personalize your glass block shower wall. Innovation #3 – Texture – While smooth faced blocks still make up the majority of the projects – a new line of “mosaic” and “pyramid” shaped blocks have textures which literally pop out of the wall. How cool is that? 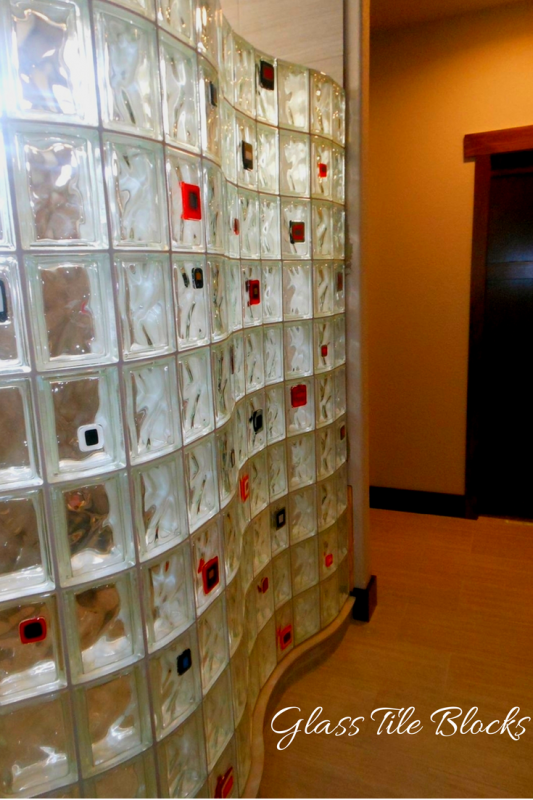 Innovation #4 – Glass tile blocks – Check out these artist inspired glass tile blocks below. 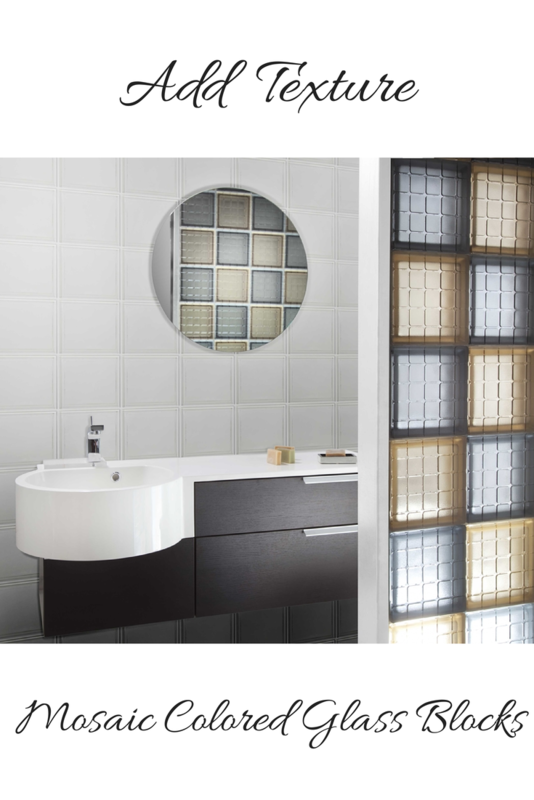 Different size and multi-colored glass tiles can now be fused onto the face of the blocks for a one of a kind designer look. Innovation #5 – Combining patterns – Using different patterns of blocks can provide an exciting contrast. The picture below not only uses the glass tile blocks (mentioned in Innovation #4), but also combines the “Seascapes” and “Decora” patterns for a very fun look. Which of these 5 innovations do you like the best? 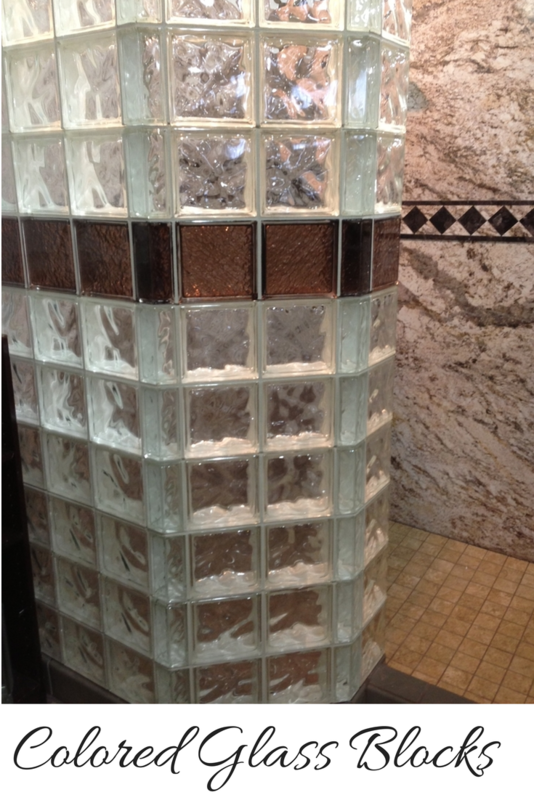 Please comment below or call us with questions on how to use these new glass block shower innovations.